Today is Mardi Gras. A splurge day before you must behave until Easter. Or something like that. Mardi Gras has a rich history, particularly in New Orleans. I have been to New Orleans, pre-Katrina, but I was there during the off season and it was still crazy. Did you know that Mardi Gras originated in Mobile, AL? I’d always assumed New Orleans! I’d never had a King Cake before, but essentially it is brioche (the “cake”) and gold, green, and purple sprinkles. 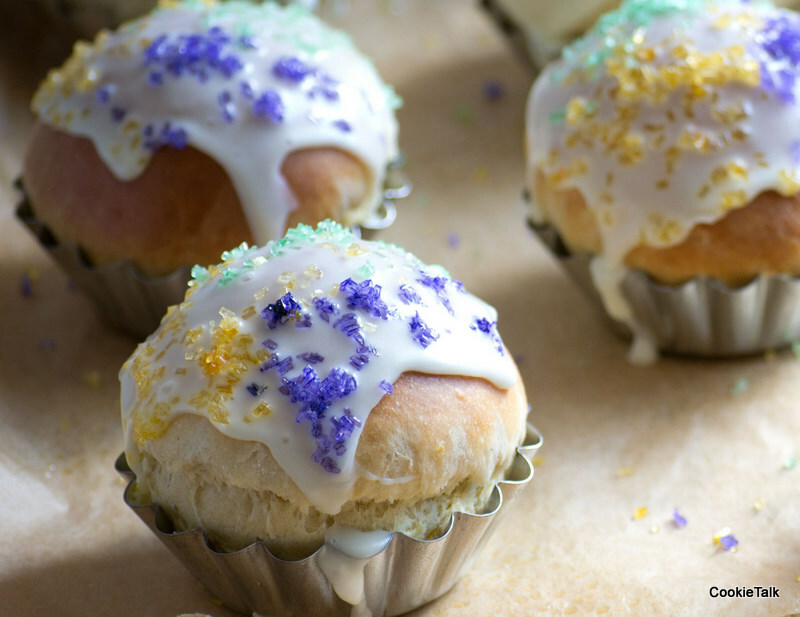 Williams-Sonoma did a fun blog post on King Cakes describing the sugars as “…purple for justice, green for faith, and gold for power.” Those are some seriously loaded sugars. 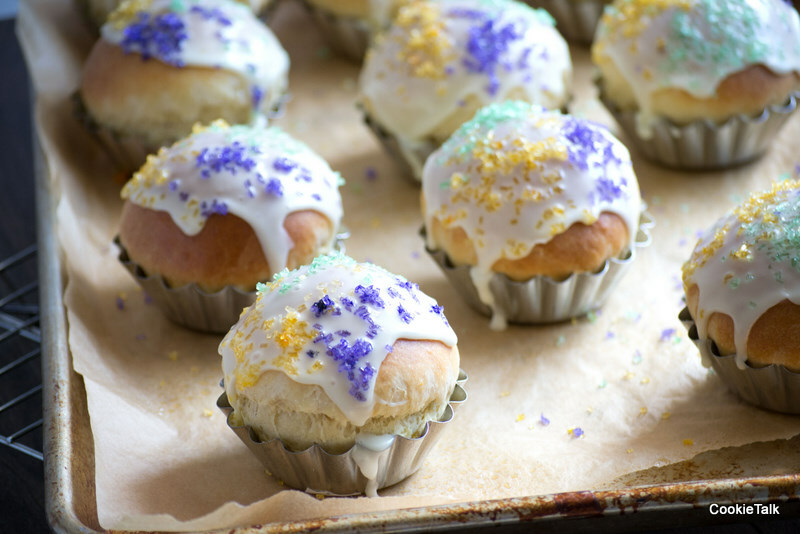 Newer versions of King Cake include various fillings, such as cream cheese and praline. And in true Alabama fashion, their version of the King Cake is deep fried. I would expect nothing less. I’m sure you’ve heard of hiding a prize inside the King Cake. In past years it would be jewels (the wealthy), beans (the poor), almonds, and in most recent years…a plastic baby. The plastic baby really creeps me out for some reason. I mean, it’s a piece of plastic in your cake! I just find that odd, so I omitted that part. Forgive me. But the main point of the prize is that whoever gets the prize is in charge of bringing the King Cake next year. I don’t mind making them again. They were easy and very tasty. I found my recipe from King Arthur Flour but you could really use any brioche recipe, add some lemon and nutmeg, glaze it, sprinkle some sugars and voila! King Cakes! 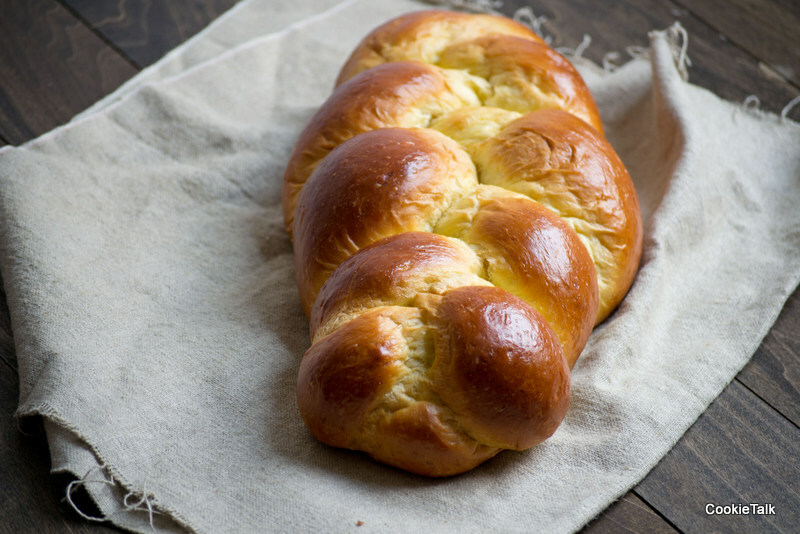 This brioche recipe is a little bit “cak-i-er” and less “bread-i-er” than other brioche and it was fast and easy to make. Less than four hours including bake and rising time! Can’t beat that. If you don’t have gold, green, and purple sugars, make your own. Just add a little food coloring to your sugar. Easy. I had gel food colors so I put a dab on a toothpick, spritzed with water, and added to the sugar. It doesn’t take much at all. 1. 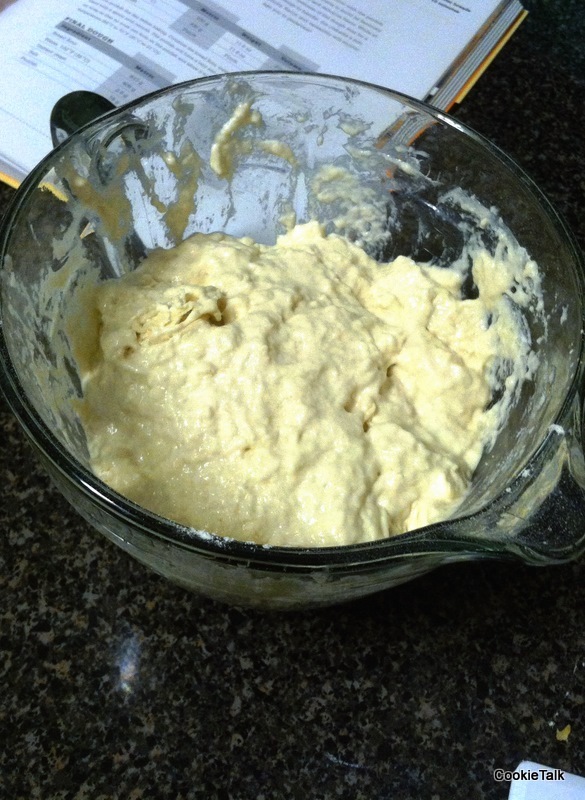 Combine all ingredients for dough into mixer. Mix with dough hook for 5 minutes on speed 1 until dough comes together. Increase to speed 3 until dough forms a smooth ball. You may need to sprinkle more flour into the dough. I had to add about an extra 1/2 cup because the dough was just too soft. It should be soft and slightly sticky, but still have some shape. If it is just a sloppy mess, you will have a hard time with it. Sprinkle one teaspoon at a time and let mix completely before adding more. This step may take 15 minutes total. 3. Scale into 12 equal pieces (I did 10 since I only have 10 brioche pans). Shape into rolls. This will be very easy to do since the dough is easy to work with. 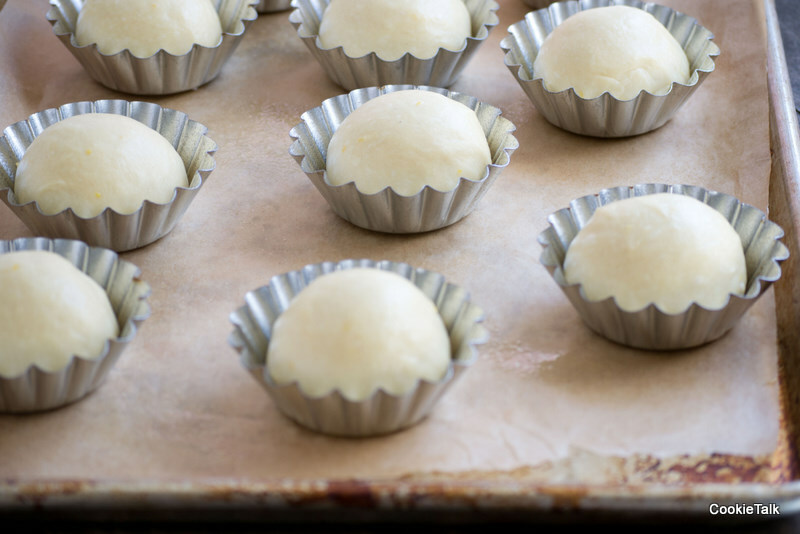 Place into greased muffin tins or brioche pans. 4. Let rise for another hour (but not in your oven this time) covered loosely with a towel. While the dough is rising, preheat your oven to 350F. 5. 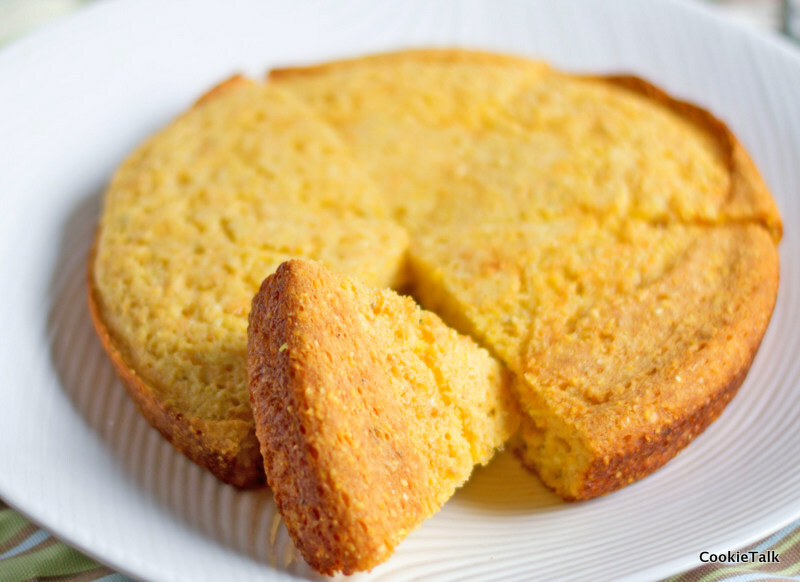 After rising, combine the reserved egg with about a tablespoon of water, mix thoroughly, and brush on the cakes. Bake the cakes for 35 to 45 minutes, tenting if they brown too fast. Check the temperature about the 30 minute mark. It should read at least 180F when they are ready. 6. To make the glaze, just combine all the glaze ingredients together, adding more milk if needed. After the cakes have cooled, dip in the glaze and sprinkle with sugars. Eat! 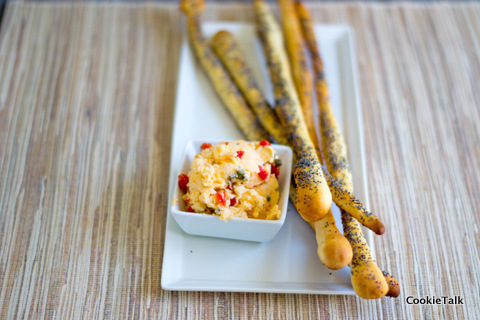 Check out more bread recipes at Wild Yeast. How did we get to the middle of January already? Wasn’t Christmas just yesterday? The month is flying by and I can’t believe it has been two weeks since my last post. Oops. I have no good excuse, really, other than, where did January go? Wait, I already asked that question. Oh, and I was going to post my birthday cake, but well, it was a bit of a disaster. My cake, that is, not my birthday. I had a great birthday and ended up just buying a cake. Shock, I know! 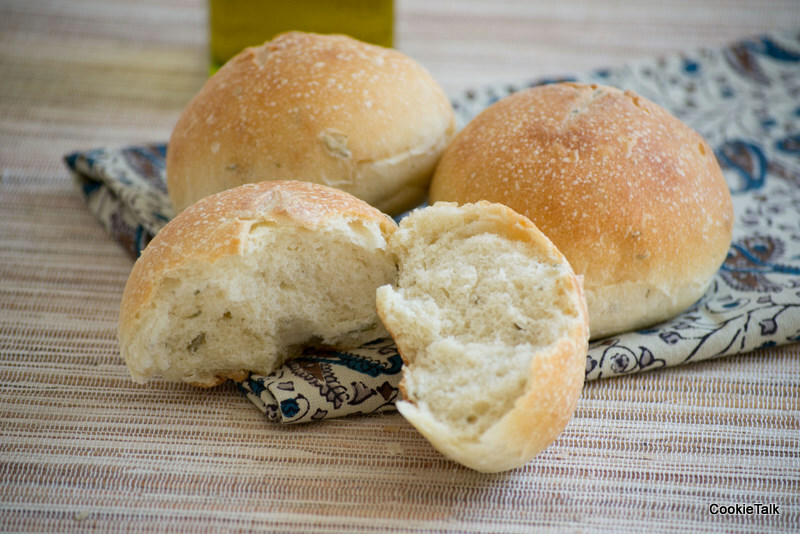 This bread, rosemary olive oil, is definitely one of my favorites. I first learned the recipe back in culinary school and it has become a staple in my house. It’s great for burgers (I prefer black bean), great just dipped in olive oil (with a glass of wine and cheese), great with pasta and salad. Don’t forget breakfast…slather a little butter and you have the perfect companion for your eggs. It’s a one stop shop! And, it freezes and reheats beautifully. It has a crusty exterior and a pillowy interior. It works great as rolls and great as a loaf. 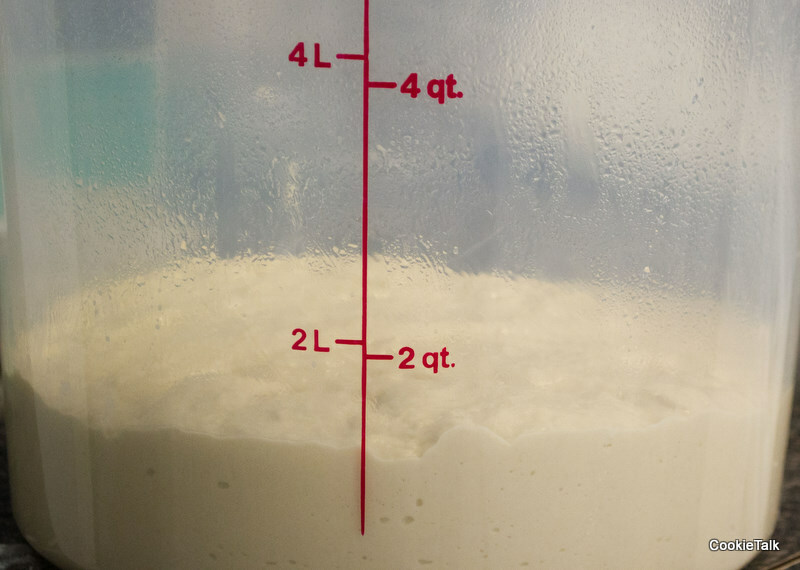 It can all be made in one day since the starter only needs three hours. You can mix up the herbs if you don’t have (or like) rosemary. 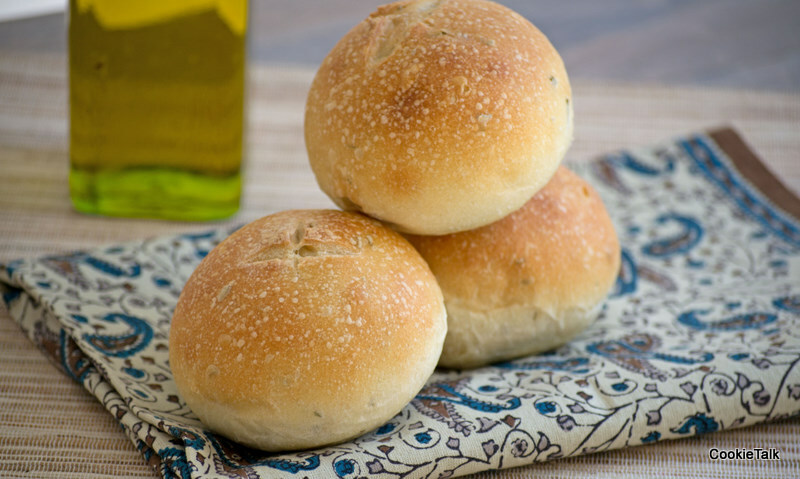 The recipe comes from DiMuzio’s Bread Baking: An Artisan’s Perspective. It was the book we used in culinary school and I continue to use it for reference and my favorite recipes. It has the history of bread baking, important techniques, and so many great recipes. It doesn’t have a lot of pretty pictures and sometimes reads like a textbook, but I still find it incredibly useful. 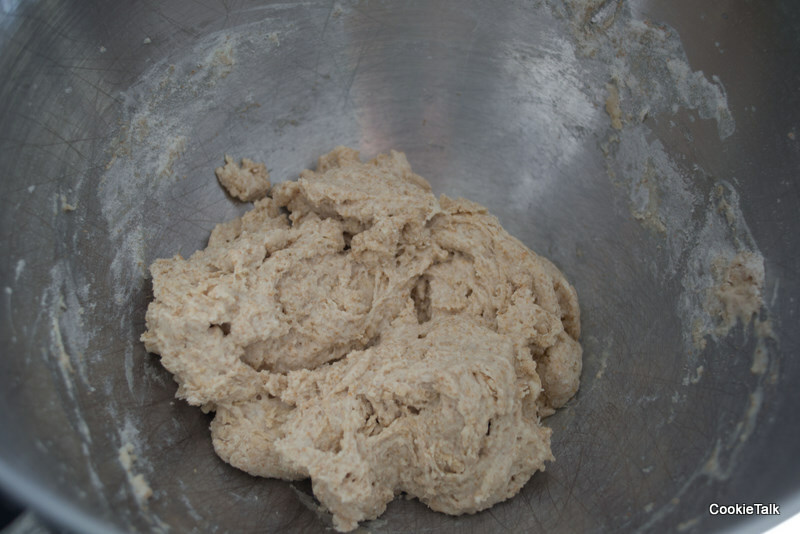 To make the old dough, scale out all the ingredients and knead lightly until combined. It will not be smooth. Just knead until it is all combined and starts to get slightly sticky. Let rest for three hours at room temperature or let rest one hour at room temperature and refrigerate overnight. *If it is humid, add less water. Start with 450 g. If it looks dry in the mixing bowl after a couple minutes of mixing, lightly spritz with additional water. **Any herbs can be used. Dried will work too. 1. Scale all of your ingredients into a mixing bowl and attach the dough hook. It helps to put the ingredients in the bowl in this order: starter, liquid, dry. That’s usually the case with most bread recipes because it helps the mixing process. If you don’t put everything in this order, don’t worry, it will still work but may take a bit longer. 2. Turn your mixer to speed 1 and set the timer for 5 minutes (clean up stage). 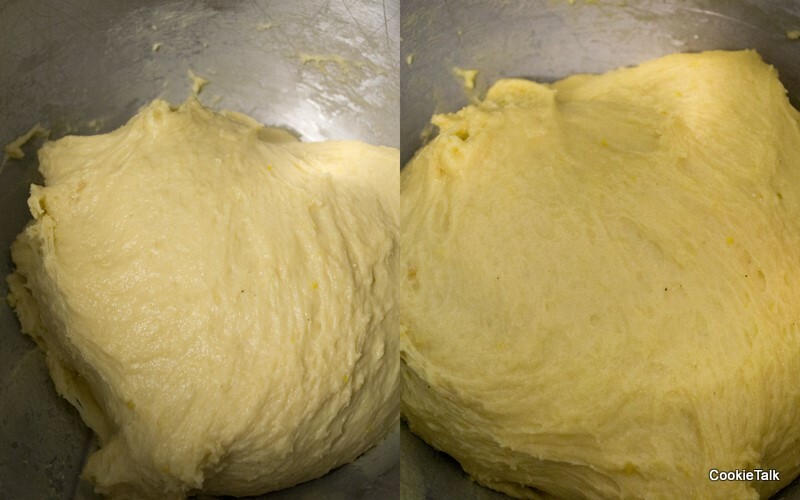 Watch the dough carefully and spritz water if it is looking too dry. After 5 minutes, increase to speed 2 for 3 to 5 minutes. 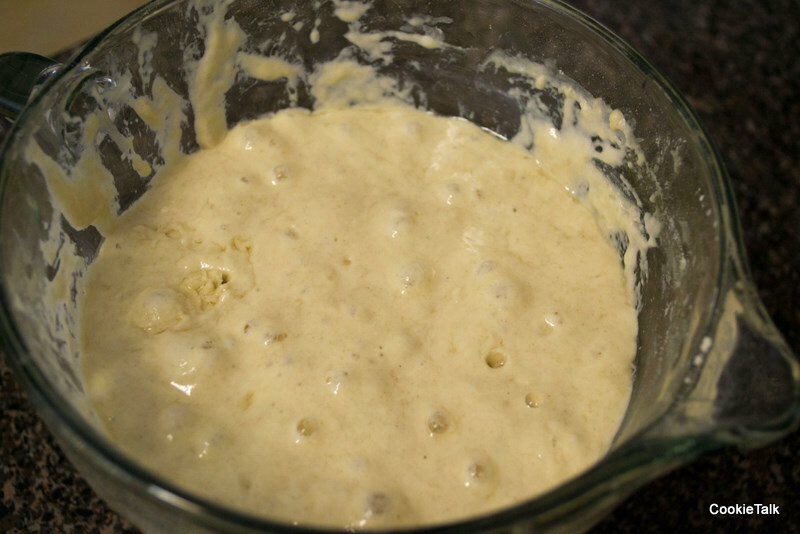 If the dough is still looking a little droopy and not well formed, mix for another minute or two. 3. Pour the dough into a lightly oiled proofing bowl. Perform one stretch and fold. Set the timer for 30 minutes and then perform another stretch and fold. At this point the dough should be fairly strong, but will need to proof awhile longer. If it is still not strong, perform one more stretch and fold after 30 minutes. It took my dough 90 minutes and my house is about 68 degrees. It will double, or come close to doubling. At this point you can either divide the dough in half and make two loaves, or make rolls. Trying to describe how to shape bread in words is not easy and I’m likely to confuse you. So once again, I’m sending you to Ciril Hitz. This particular video shows numerous shaping techniques. 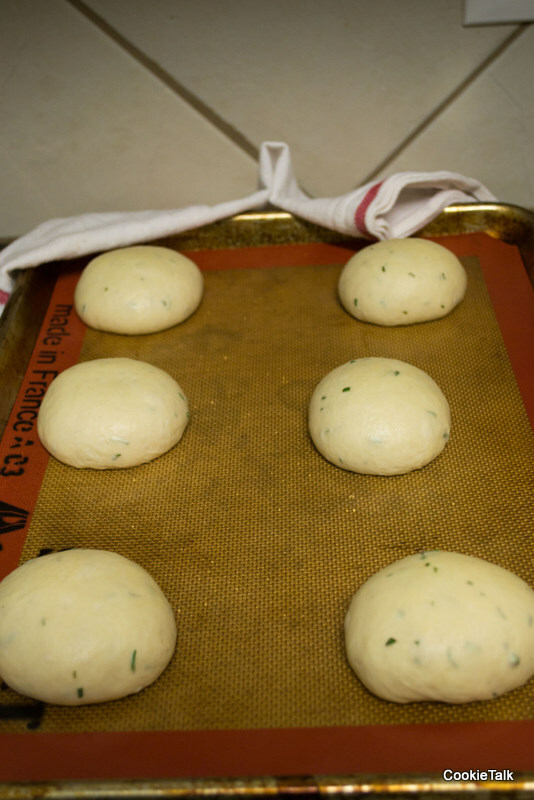 If you are short on time, making round loaves is by far the fastest way to go. 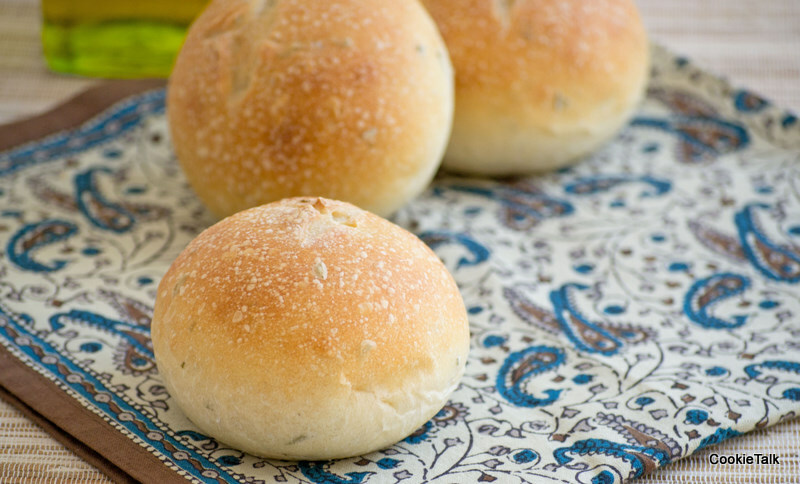 Rolls are easier to reheat individually, but take longer to shape. Here’s my rolls before rising. I did 90 g per roll. I probably could have let them rise a bit longer, but it was getting late and with my cold house, it was going to take awhile! The oven temperature will depend on what you are making. For rolls, preheat the oven to 425F. For loaves, 350F. Score the bread before baking. My hubby does the scoring in the house and he made “x” on each roll. For loaves you could do the same. It doesn’t really matter just as long as you score. Spray with water when you put in the oven to help them brown. You can also dust lightly with flour if you desire for a more rustic look. 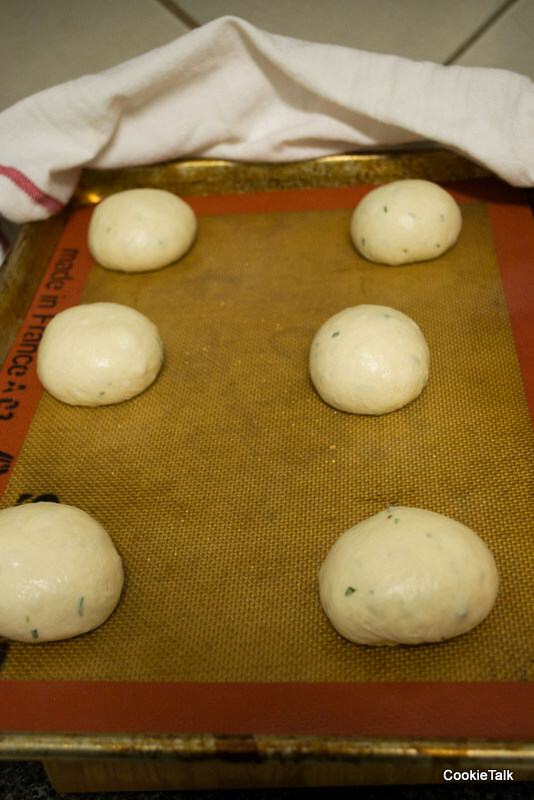 Bake the rolls for about 20 minutes, rotating and spraying once more with water at the halfway point. Loaves will take around 30 minutes, but be sure to check the internal temperature. It should read at least 180F. I hope this bread becomes a favorite of yours too! Enjoy! 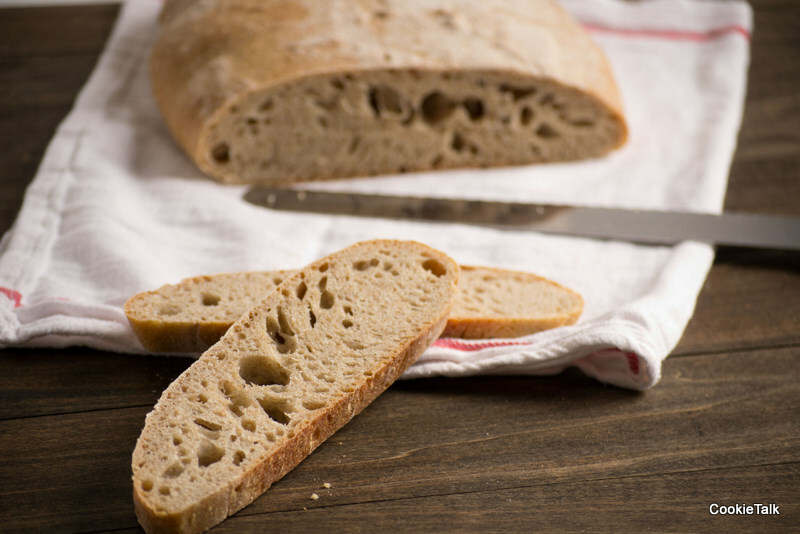 As usual, check out Yeast Spotting for more bread recipes and tips! Happy New Year! It’s been cold here the past few days, down in the 20s at night. And since I’ve been in warm environments for the past eight years that is darn cold to me. But I was born and raised in the frigid state of North Dakota, so people are shocked to find that I’m from there and actually get cold (and also because I’ve lost all traces of my Northern accent. Seen the movie Fargo? Yup, that’s how they talk). In my defense, I was not a very good North Dakota girl. Up there people will start leaving their coats at home when the temperatures rise, yes rise, to the 30s. I was still bundled up. People start wearing shorts when the temperatures hit 50, meanwhile I was still wearing my warmest sweaters. So I was never very good at being a North Dakotan. And now when I’m cold the first thing I do is make some hot soup. And you can’t have soup without bread right? As part of my New Years goals I want to blog about bread more. It’s easier than you think and can easily be worked into a busy schedule. I know lots of people are starting their “eat healthy” New Years Resolutions, many which will die in a matter of weeks, and may be cutting out bread entirely. I long ago quit trying to lose weight by cutting out the things I love. I love bread and I love desserts so any diet not involving those will fail. So instead I eat some every day. But not a lot, just normal serving sizes (with the holiday period excluded, of course; all willpower is out the door). It works for me and I hope it can work for you too. 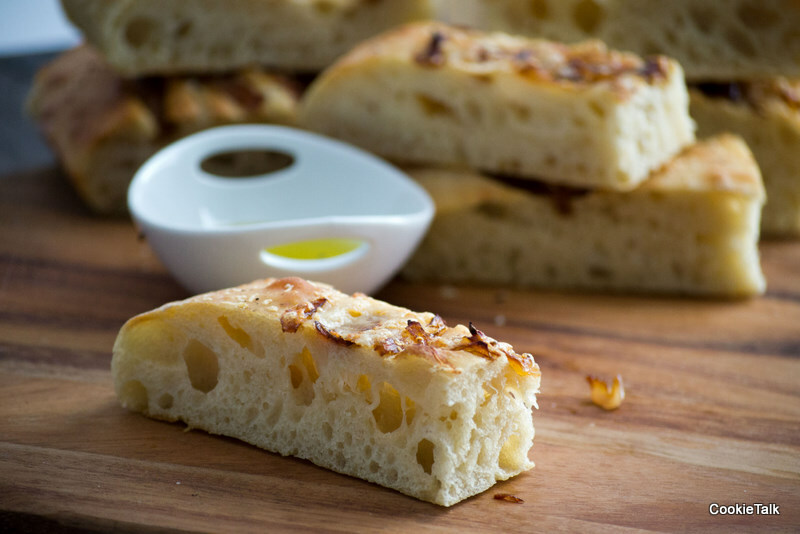 Focaccia is a great bread for beginners because there is no shaping involved. Unfortunately it is not a bread that you can just leave alone for hours; it does require a minute (literally) of your attention every 30 minutes for about 2 hours. But total hands on is about 45 minutes. Basically you just have to be home. 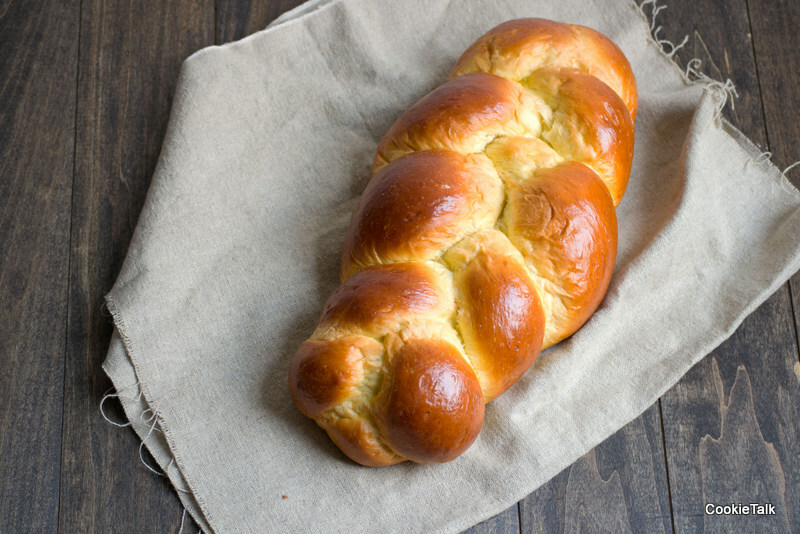 This recipe is from Ciril Hitz: Baking Artisan Bread. I highly recommend this book to anyone wanting to make bread. Lots of pictures and very clear step by step instructions. And it comes with a DVD with videos on shaping, which is also quite helpful for a new bread bakers. 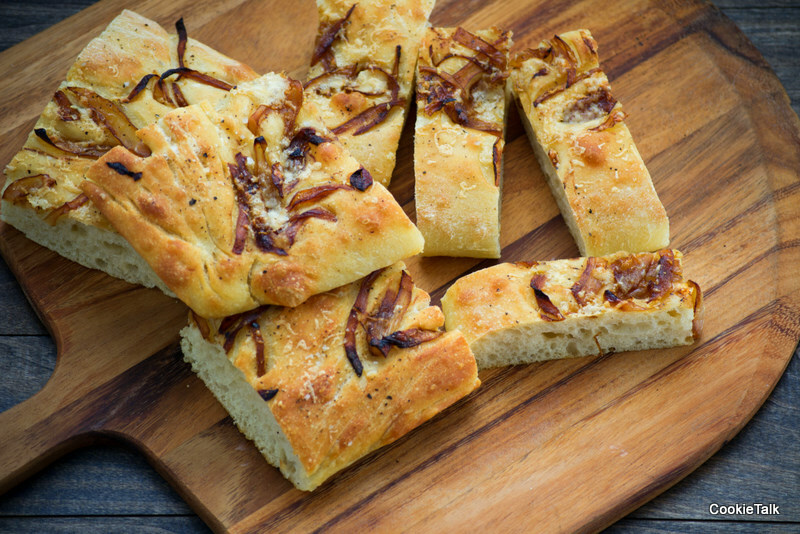 Focaccia is a very versatile bread. You can keep it simple and just sprinkle with salt & pepper. You can do what I did and put caramelized onions and cheese on it. You can use it to make a sandwich or just dip it in olive oil. 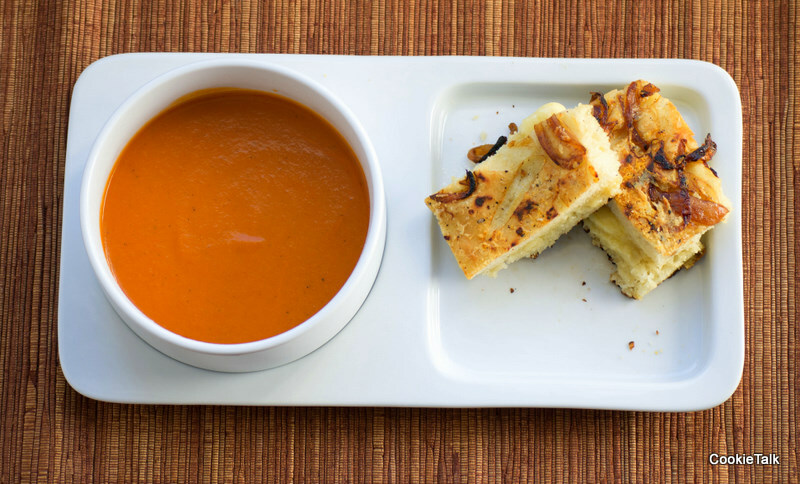 And no one can resist the light and airy texture, so perfect for dipping in soup. 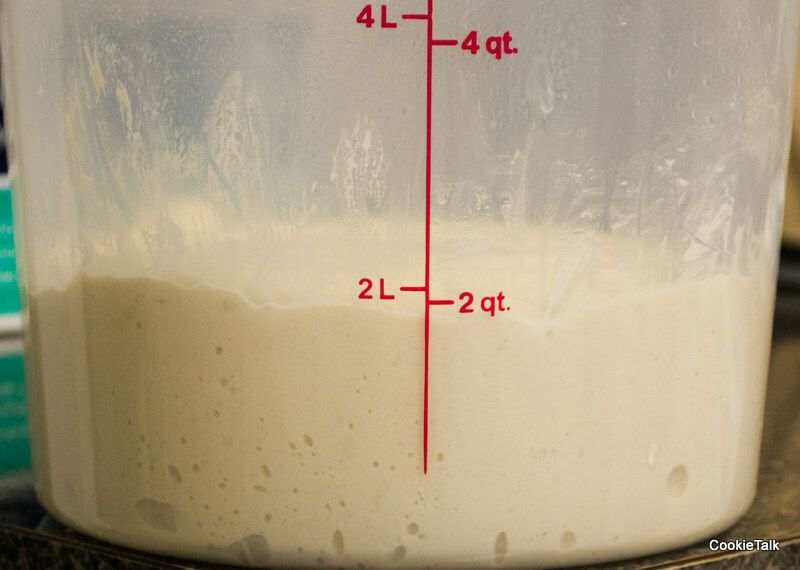 A couple of tips on bread making: a scale is not necessary but will give you better results. And it is much easier. 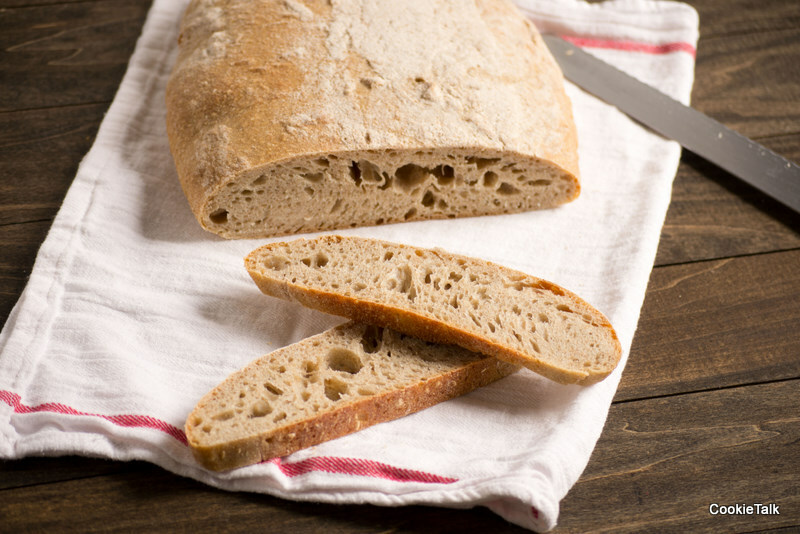 All of my bread recipes use instant yeast, which is different from the active dry yeast found in grocery stores. 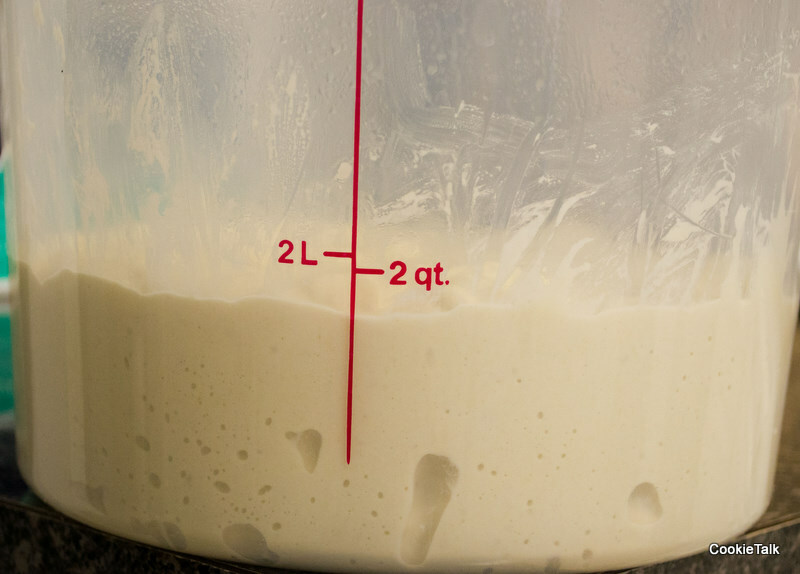 Instant yeast requires no proofing. You just throw it in the bowl with the rest of the ingredients and away you go. I find it much more convenient and cheaper. You can find it at Sam’s Club or at King Arthur Flour. That 16 oz bag lasts me a year stored in the freezer, so you can see how much more affordable it is compared to active dry. And really, who wants to sit around waiting for yeast to proof? And the most important tip yet: use good flour. You know I use King Arthur. In the summer I can get a local flour at the farmers market which also works great. Stay away from store brands and anything bleached. Also, bread flour will give you the best results but if you can’t find bread flour AP will work, just expect it to be less chewy. Enough chit chatting, let’s make some bread! *I used 413 grams of Bread Flour and 200 grams of KAF Italian Style Flour, which has a very low protein content. I wanted the chewiness of the bread flour, but also wanted an light bread. I’m guessing you aren’t like me though and don’t have five six seven different kinds of flour in your pantry, so if you want to mix it up use both bread flour and AP flour. 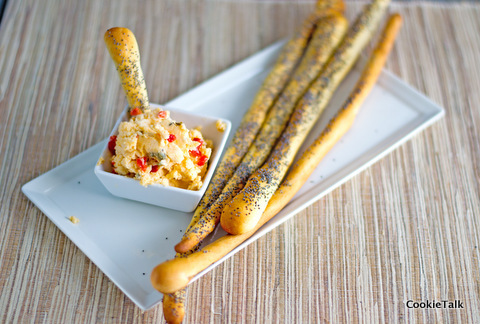 **If you are making this bread in the summer time in a warm kitchen lower the temperature to about 80 degrees. If you don’t have a thermometer, first, get one, and until then just use your finger. If it feels hot, it probably is and will kill your yeast. Better to go with cooler water than warmer water. It will just take your bread longer to rise. Place all ingredients into your mixing bowl. (Since this is such a wet dough, it’s really hard to do by hand. You can though, just use a wooden spoon to stir or a dough whisk.) 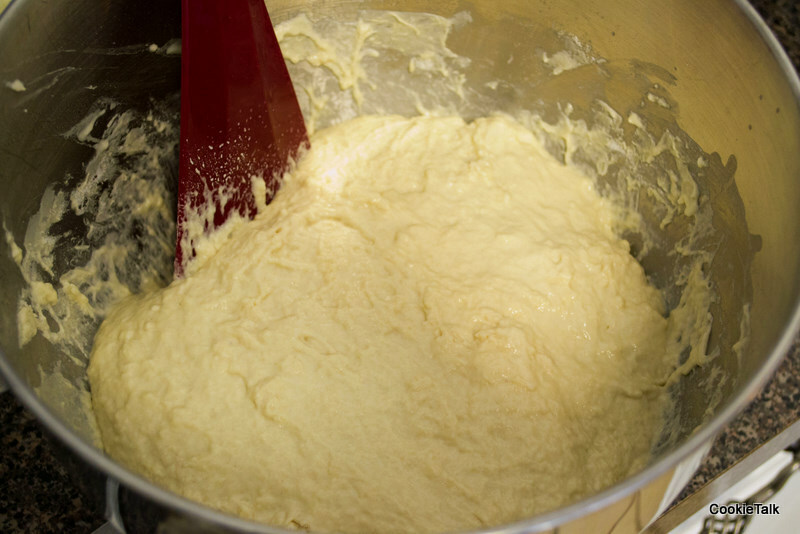 Using a dough hook, turn the mixer speed to low and mix for six minutes, stopping every two minutes to scrape the bowl. If you don’t scrape the bowl you will have blobs of flour that didn’t get mixed. There’s really no structure yet at all since it is a wet dough. We’ll fix that though with multiple stretch and folds. I tried to take a picture of myself doing stretch of folds which was nothing short of disastrous, and instead found this video of Ciril Hitz doing a stretch and fold, as well as explaining the purpose. 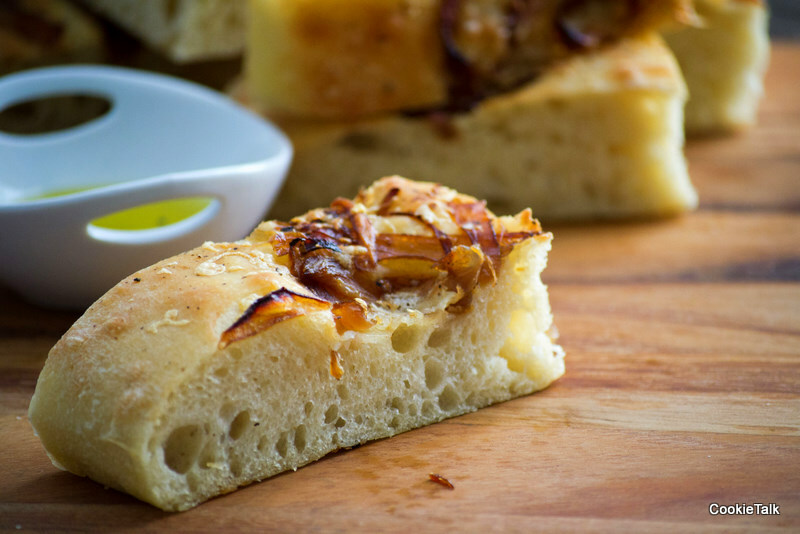 He’s using baguette dough which is much stronger than focaccia, but it serves the same purpose. The first stretch and fold you do will be quite difficult so don’t fret. Just do the best you can and know that the dough will get stronger. You should notice the dough getting stronger and easier to stretch at this point. Set your timer for another 30 minutes and then the final stretch and fold for a total of four including the first one right out of the mixing bowl. More bubbles! Set your timer again for 30 minutes for the final resting before transferring to a pan. Look at all those bubbles! And you can see it pretty much doubled in size. That may not always be the case though. 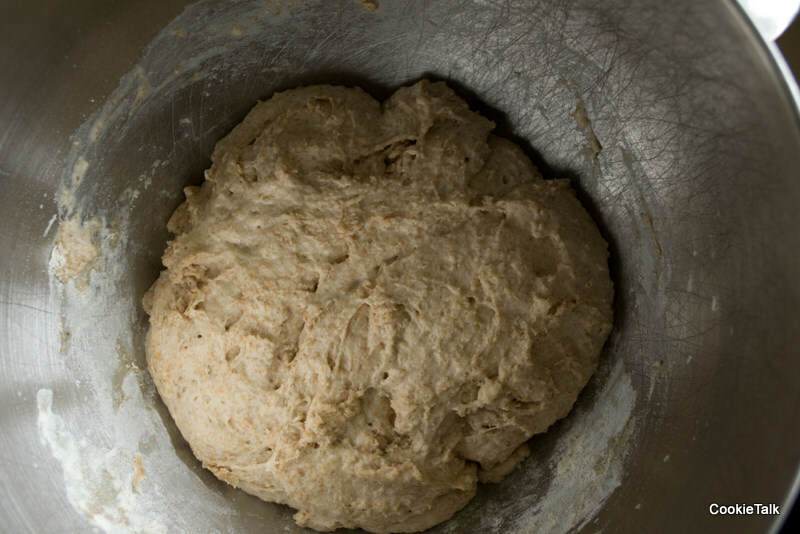 The signs that your bread is ready: dough should be noticeably stronger than when you first finished mixing. At this point, prepare a half sheet pan with parchment and olive oil. 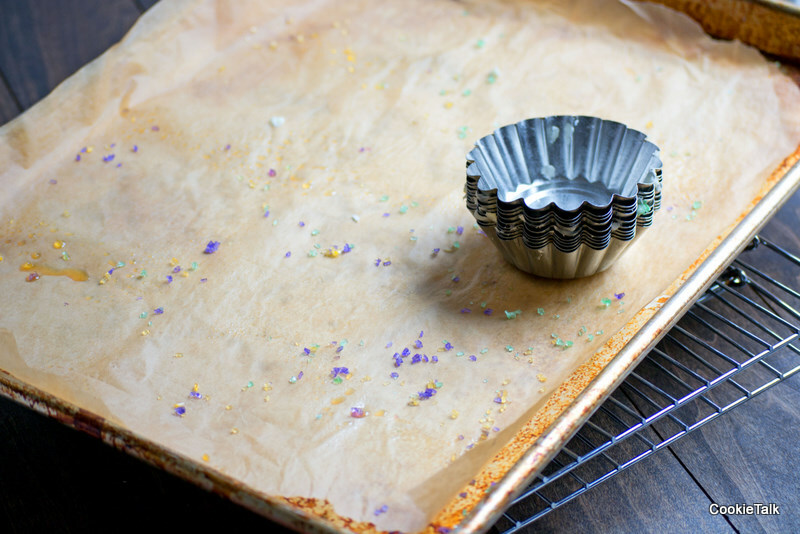 Alternately, you can use round cake pans. Ten inch work best and you’ll have to divide the dough in half. Looking yummy, huh? Let rest for another 15 minutes before baking. Then bake in the preheated oven for about 30 minutes or until golden. If you are adding cheese, add after about 20 minutes of baking. Delicious, huh? It really is as good as it looks. Try to let it cool for 30 minutes before slicing. That will be hard though! For the soup, I used this recipe for a guide: Tomato Soup but am out of celery and carrots. Sheesh, guess I need to head to the store! 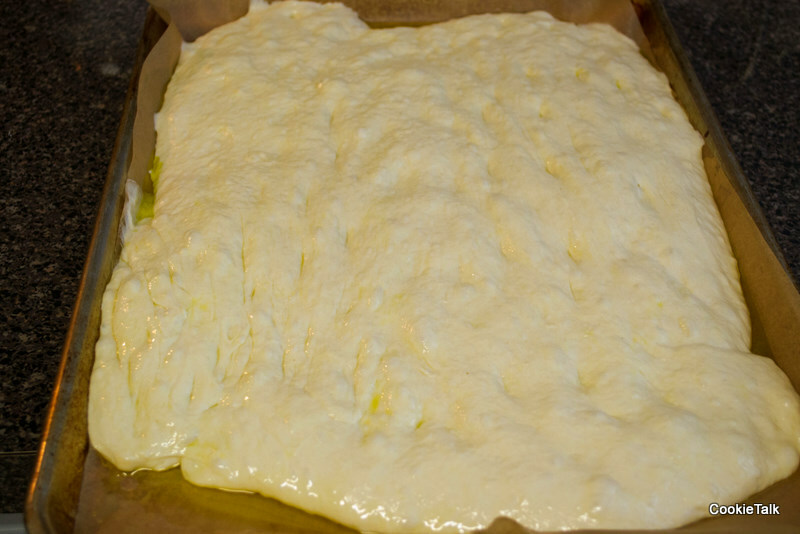 I hope you enjoyed making focaccia. The possibilities are endless with this bread. Enjoy! 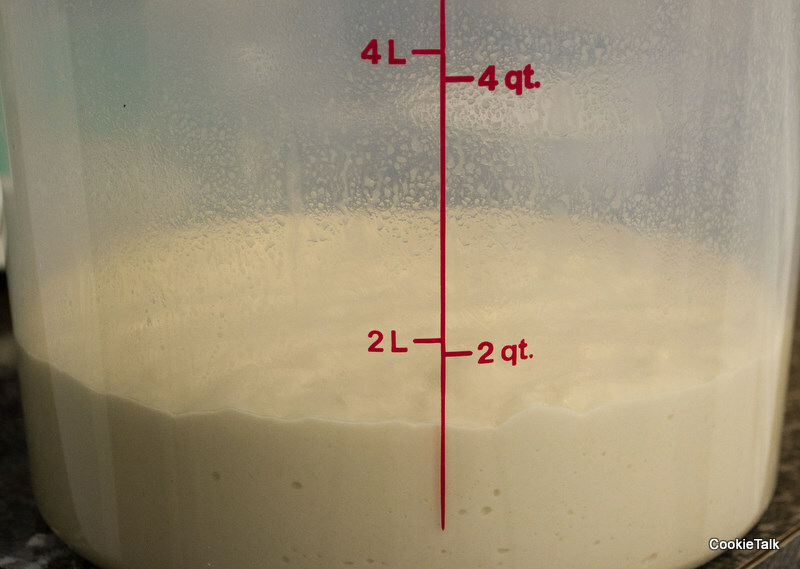 Check out Yeast Spotting for more bread tips and recipes! Our Daring Bakers Host for December 2011 was Jessica of My Recipe Project and she showed us how fun it is to create sourdough bread in our own kitchens! She provided us with sourdough recipes from Bread Matters by Andrew Whitley as well as delicious recipes to use our sourdough bread in from Tonia George’s Things on Toast and Canteen’s Great British Food! I’m not new to baking bread. In fact, we haven’t bought bread in about two years because I’ve been making our bread exclusively. I know, I know, I hardly ever post bread on here. That’s because making bread is second nature to me now. It’s part of my daily routine. But my New Year’s Resolution is to blog all my favorite bread recipes in January and February. And I’ll give you plenty of tips so that you too can start making bread on a regular basis. This recipe, however, is messy, not easy to work with, and terrible to shape. All that is fine for an experienced bread maker, but may be frustrating for a new bread maker. It was frustrating for me! It does taste good, but not like sourdough that you are probably accustomed to. The good thing about this bread is the crumb structure. You’ll notice how light and airy it is. That’s because this is an extremely wet dough! Almost as wet as ciabatta, which is also very light and airy. I did not make this bread by hand, but used the dough hook instead. 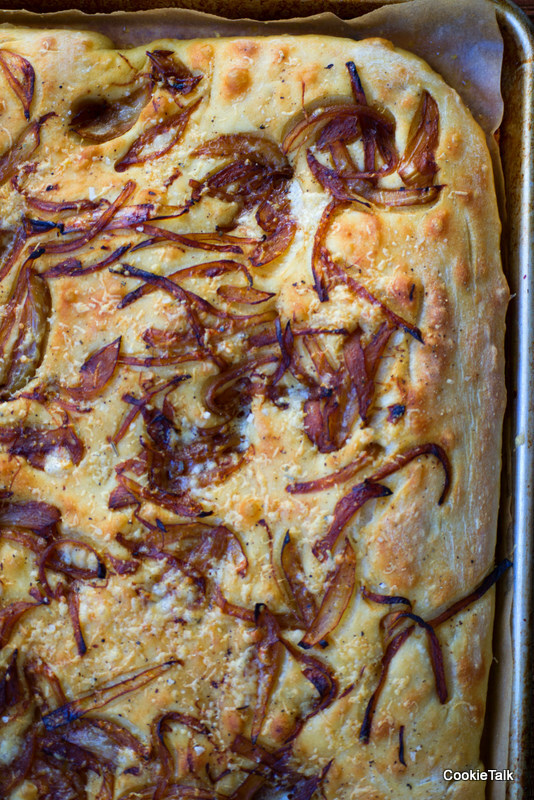 It’s much easier to make bread that way and I especially recommend it for this dough. It will make your life easier! This is a minimum of a five day process, though very little actual hands on. My starter took much longer since it is quite cool in my house right now. I gave my starter almost two weeks to get going, at first feeding daily (and quite appalled at the initial smell, so much so that I almost threw it out), then every couple of days as it started to grow and bubble. It won’t smell tangy since it is a new starter, but it should bubble and start to smell yeasty. Read through the entire procedure before starting. And if you are new to bread making, don’t be afraid to try it. It is challenging, but pretty hard to screw up. The biggest rule is to use quality flour. 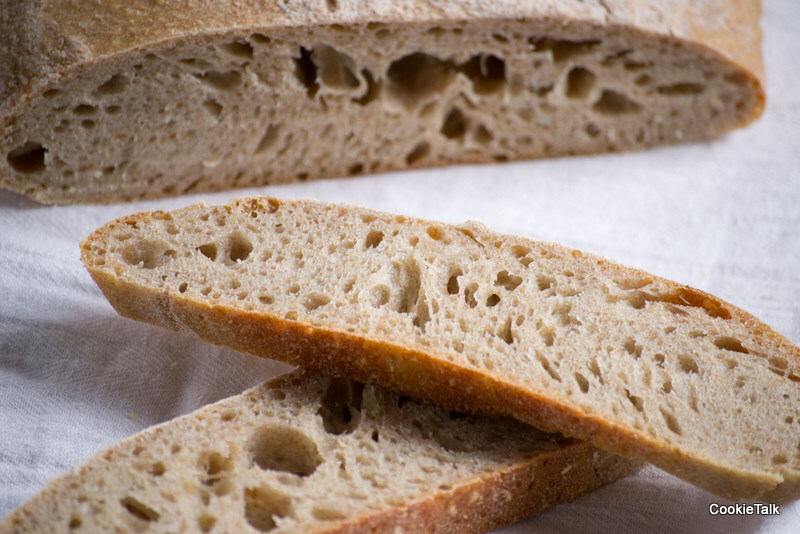 Using good quality flour is always important, but it makes the biggest difference with bread. 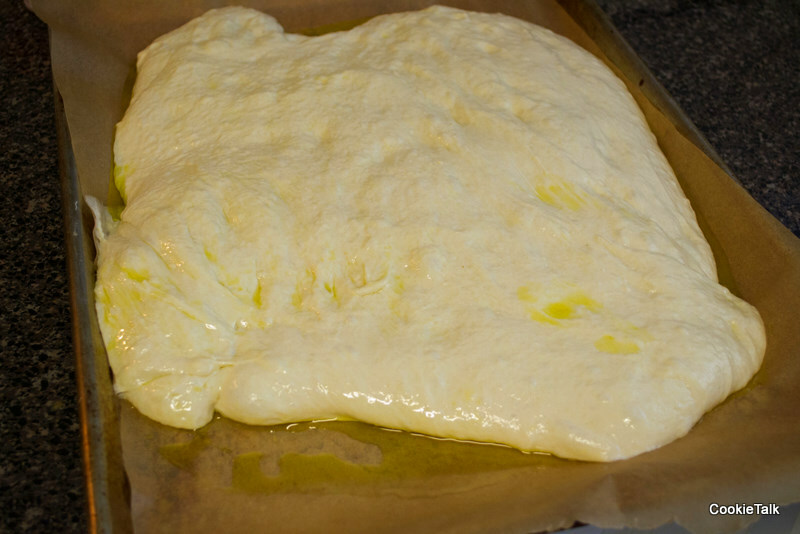 I once used cheap flour for pizza dough and the recipe completely failed. Switched to a good bread flour and I had perfect pizza. So skip store brands and go for unbleached flour and good wheat flour. 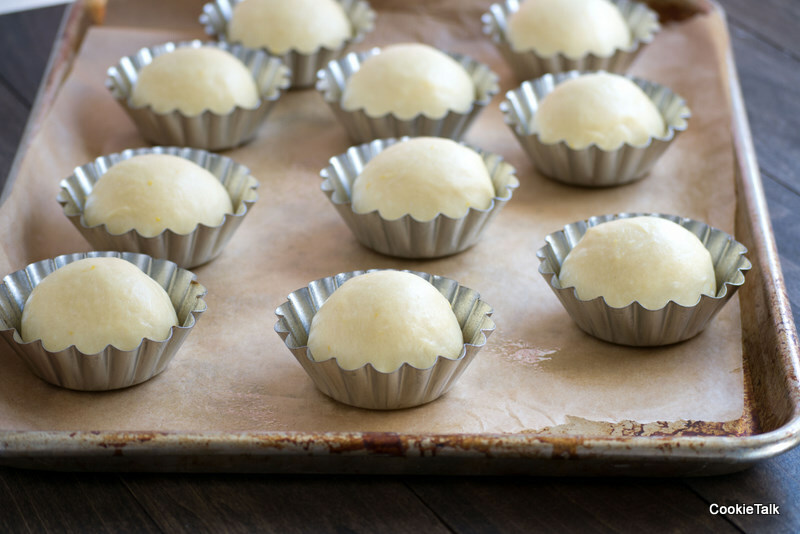 In a medium sized storage container, mix the flour and water into a paste. Cover and set aside in a warm place. Mix flour and water into previous days mixture. Cover and return to warm place. Mix flour and water into mixture. At this point it will hopefully be bubbling and starting to smell pleasant. Mine was not at this point and I almost threw it out because I did not like the smell. I continued this step for several more days and it was bubbly and smelling yeasty, so I think it was the wheat flour that gave a different smell than what I’m used to. I’ve never used a wheat starter before. After about 3 days of feeding with white flour, I started feeding every other day and reduced to 1/3 cup flour and 1/4 cup water. I didn’t actually use the starter until day 13, although it was ready a few days before that. I just didn’t have time when it was ready. I kept it at room temperature and continued to feed it. Mix all together with a wooden spoon or this nifty contraption. It will be messy and not form a smooth ball. I mixed mine in the mixer bowl since I knew I’d be using it later. Loosely cover with plastic wrap. 1. Using the dough hook on your mixer, knead for about 10 minutes or until mixture is smooth and pulls away from the bowl slightly. It will still be very sticky though. Alternately, mix with wooden spoon and knead lightly. Let rest for one hour. Avoid adding additional flour if you knead by hand. Just dampen them with water. 2. After one hour, perform a set of stretch and folds. Just stretch each of the four sides over onto itself and form a smooth ball (it will be difficult since it is a sticky dough. Dampen your hands with a little bit of water to make it easier). If you have a bannetone, spray it with non stick spray and flour very heavily, all the way to the top. Or place a thin towel or bannetone liner and flour heavily. If you do not have a bannetone, place a thin towel, heavily floured, into a shallow bowl. 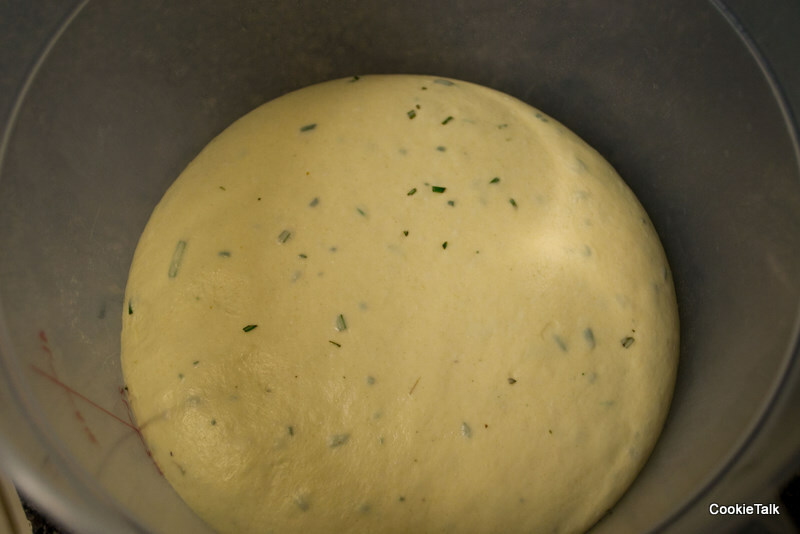 Place the dough into the bowl, seam side up (if you have a seam, might be too sticky). Lightly flour the top and cover loosely with a thin towel. 3. Let rest another 3 to 5 hours. It will double in size. Once it is almost ready, preheat the oven to 425F (remember to take your dough out first if you are proofing it in the oven!). 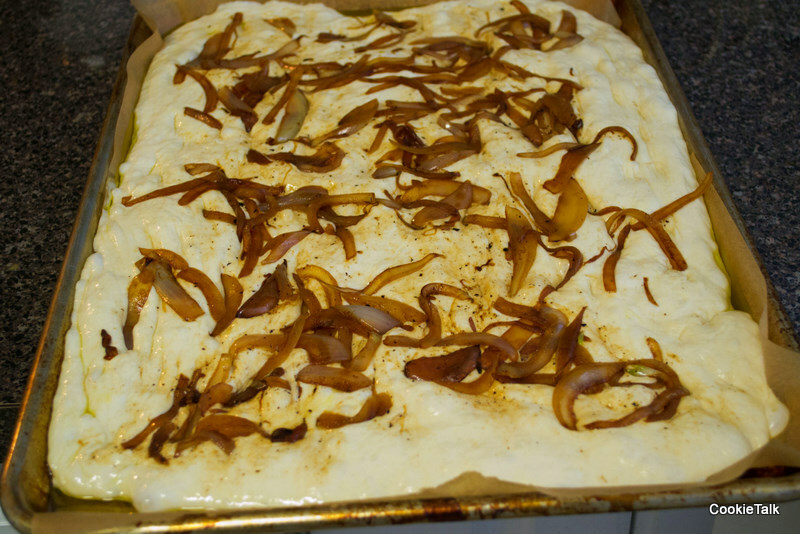 Take the dough and flip it onto a sheet pan lined with parchment or silpat. The easiest way to do this is to put the sheet pan on top of the bowl and flip it over. It may stick a bit. If so, just use a knife to gently cut away the parts that are sticky. Try not to pull the dough too much at this point. 4. Using a sharp knife, lightly score (cut) the bread in about three spots. Just use a quick movement to cut the dough about 1/2 inch. This will allow the bread to bake evenly and will make it look pretty. However, your dough may be too sticky and this will not work. Don’t fret if it doesn’t. 5. 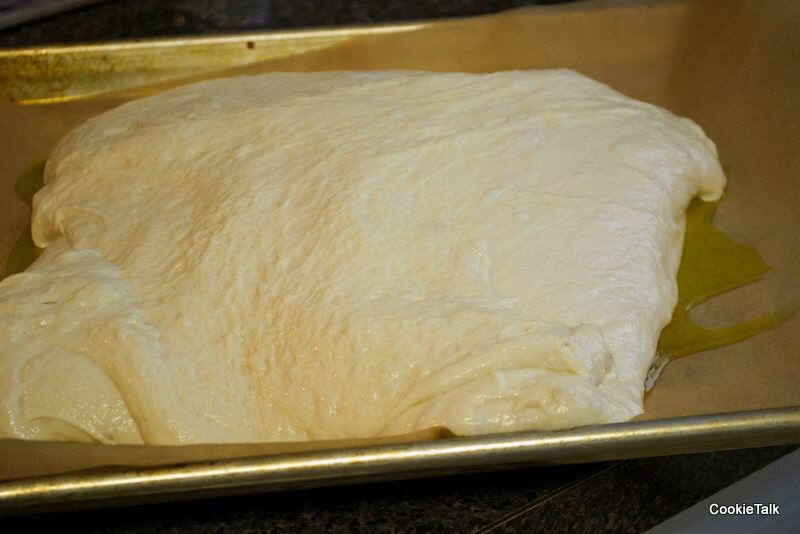 Place dough in oven and lower temperature to 400F. Bake for about 40 minutes or until bread is golden. Temperature in the center should be no less than 190F. 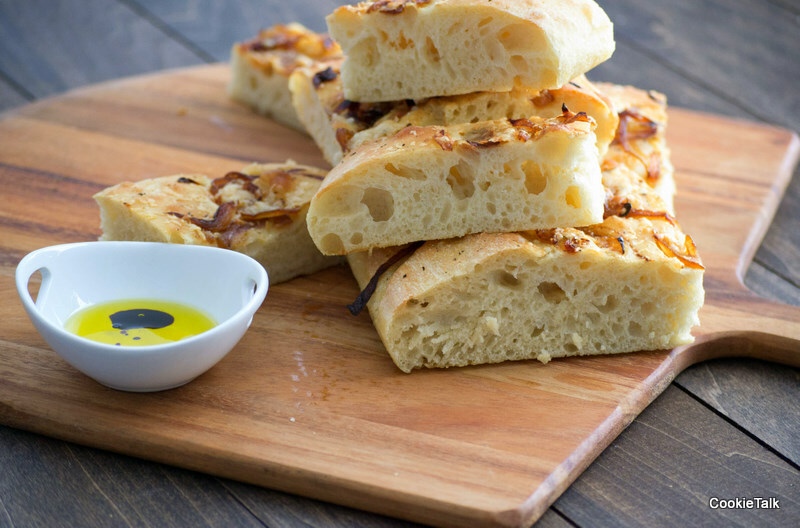 Some tips on using your bread: I like to enjoy bread with either butter or dipped in olive oil and a glass of wine to wash it all down. But this bread makes a great sandwich. I had some leftover prime rib which I sliced thin, warmed up in a saute pan, sprinkled some cheese on it, and placed between two slices for a very tasty lunch. It would make a great panini, grilled cheese (for a grown up version try adding some sauteed mushrooms and onions), and crostini. 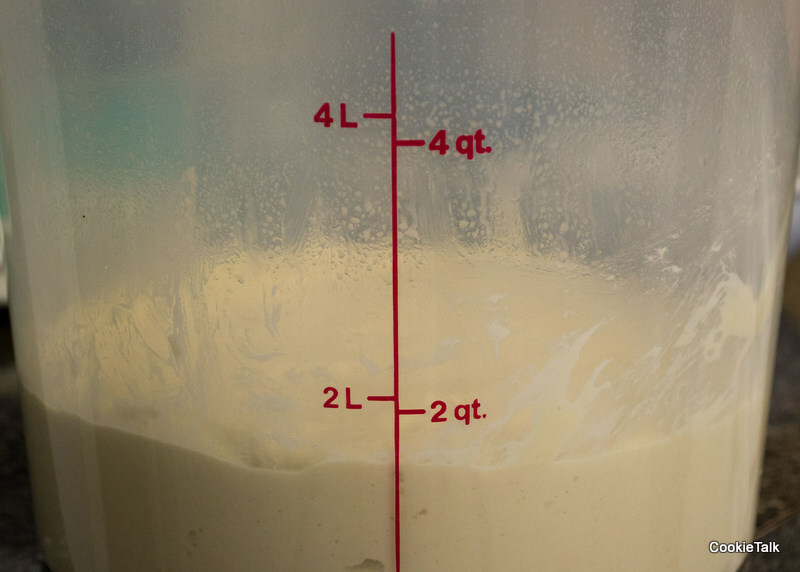 Maintaining your starter: If you won’t be using your starter for a week or more, place in the refrigerator and take it out to feed once a week. At least every other time you feed it, discard some of the old starter before stirring in fresh flour. Cleaning your kitchen: In this day and age we are obsessed with anti-bacterial everything. This kills all the good bacteria and can actually hurt your starter when it meets your kitchen counter. And, those chemicals can get into your bread as well. I clean my kitchen with vinegar, baking soda, and mild soap. That’s it. No ultra-kill-everything-die-germs-die cleaner, just the basics. It’s cheaper and better for you. Vinegar still kills all the bad bacteria while leaving no residue behind. At the very least, refrain from using the harsh chemicals where your bread will be.